Can I change my wave time prior to the day of the race? Yes. You will be able to transfer to another wave time that is not sold out. You can visit your registration confirmation email for information on how to change details about your registration, wave time, T-shirt size, or team details such as name or teammates, etc. No. We do not issue refunds as spots are reserved. If you would like to transfer your entry to another participant, you may email us at: [email protected] to process this request. No transfer will be allowed the day of the race. How can I prepare for this race? Strength and conditioning, specifically for endurance, balance, and coordination will help you with overcoming the obstacles. If you are not a runner you may want to begin light jogging to help you with the miles ahead. When should I arrive on race day? Gates open and check-in begins at 7:00 am. Please arrive at least 1 to 1.5 hours prior to your wave time. This will allow you to find a parking spot, get checked in, hydrate, stretch, and be ready at the start line. Race to the finish line, not the start line! Every runner MUST turn in a signed waiver on race day. To save you time during check-in, you may print your own waiver and fill it out ahead of time. Minors (under 18) will need a parent/guardian to sign their waiver. If you miss your scheduled wave time you will have to wait until the next available wave. Is there a cost for parking? No. There is free parking on site. Carpooling is recommended as parking is limited. Bring your friends and family to cheer you on, spectators are free. Your pace and athletic level will determine the amount of time it takes you to complete the course. For top athletes, you can expect between 40 minutes to an hour. For the average participant, you can expect that it will take 1 hour or more. Will there be a place for personal belongings? There will be a bag check area. The cost is $3. If I want to change my wave time the day of the event or miss my scheduled wave time what happens? If for some reason, you are not able to make your registered wave time or miss your scheduled wave, you will have to wait until the next available wave opening. In the case of a sold out event, you will not be able to run. We have hydration stations set up throughout the course where you can hydrate with water to help prevent muscle cramping. There will also be water and food at the finish line. Don’t overdo it as it can cause muscle cramping. Yes, it is your preference. Do we recommend it? No. Almost half of the 5K course is on dirt trails through the woods where you will encounter sticks, tree roots, and pine cones. If you chose to run barefoot you accept any and all additional dangers that you could encounter from doing so. What if I can’t complete an obstacle or I don’t have the courage? 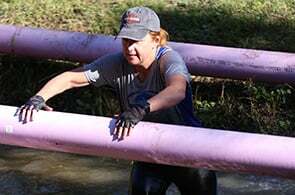 The Mud Run has challenging obstacles that will push you out of your comfort zone and past your limiting beliefs. If there is an obstacle you are unable to complete, you may choose to skip it. However, if you are registered in any of the competitive timed waves, there is a 25 jumping jack penalty for anyone who fails to complete or chooses to skip an obstacle. There are a few obstacles that require swimming in deep water. Will there be a place to clean up? 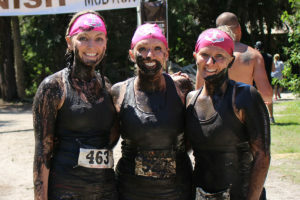 An area will be designated where you can hose off after the Mud Run. We encourage you to bring a towel, full change of clean clothes and plastic bags to put your wet clothes in. There are a limited amount of private facilities that you may change in. 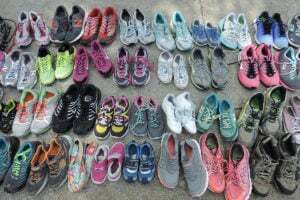 Can I donate my shoes after the race? Yes. Wear an old pair of shoes to run the race and donate them afterward. Shoes will be washed, dried and sent to help orphans in need in Africa. Will there be first-aid stations? We will have emergency personnel on site. For minor injury assessments, we will also have a first-aid tent near the finish line with personnel to help you attend to your needs. Will I be out in the sun all day? No. There is plenty of shade at Teen Missions. Almost half of the 5K course is on dirt trails through the woods. There are covered walkways around the property and Big-Top Tents with plenty of seating. What happens if it rains or there is a storm? 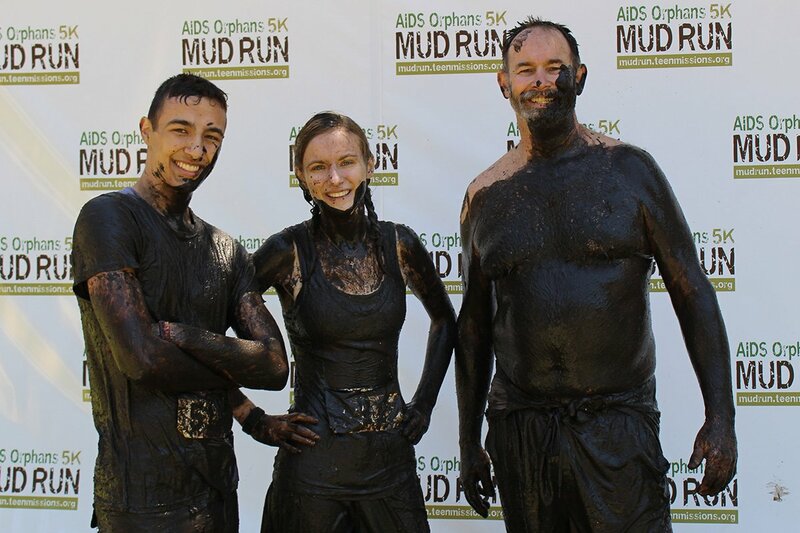 If it rains the race will continue, it just makes for more mud anyway! If there is a severe storm, such as a hurricane or natural disaster, the event will be canceled. If there is lightning present, we will postpone each wave until the lightning passes and is a safe distance from the venue. Yes. 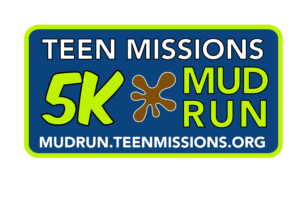 All pre-paid runners will receive a Mud Run T-shirt. No. The prices stated are per person. Yes. There will also be plenty of hamburgers and hotdogs fresh off the grill, chips, desserts and soft drinks for sale in the Big-Top. "Excellent Event! Lots of unique obstacles! MudRunFun Approved." "BEST obstacle course I've ever been on!! Great trails too!!" "Our family had the best time!!! We will definitely be back next year!" 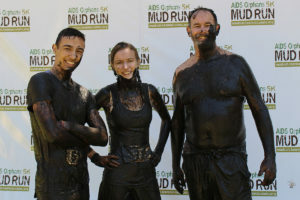 "Best obstacle course/mud run ever!!! 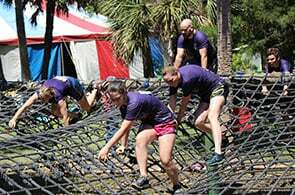 I ran the course with my oldest daughter and my 2 little grandkids. We all had the best time. We will all be back next year, plus some." "Great race.....Definitely a harder course than a Warrior Dash or Rugged Maniac......Loved some real trail running."